I have a lot of music from DJ labels such as DMC and Mastermix. I have tagged the album artist field of all my DMC music as DMC (to separate from “non DJ” compilation albums which are tagged in the album artist field as “Various Artists”). The problem is that when I play a DMC album it thinks the artist is DMC and displays all his info. Is there a way to let Roon know that the album artist tag of DMC is really just a label (or at least, NOT the artist DMC). Sorry for the bad news here, but the ‘albumartist’ tag has a defined meaning. Fill in false information will lead to all kinds of errors in Roon and may even prevent Roon from correctly identifying the album. Surely, you could try to play around with import settings (which would affect all albums) or try to edit the album, but in any of this cases you would end up losing the information falsely stored in the ‘albumartist’ tag. The best you can do here, is to correct the metadata in the affected files. I don’t know what DMC or Mastermix stands for. If these are publishers/labels then, if the albums can be identified by Roon, they most likely will have the correct music label (a.k.a. Publisher) already set. Else you can use the correct file tag to store that information in the files (see tag mapping table). Make use of the album version feature (read more about it here), but I never found a way to search, filter or focus for them. As BlackJack suggested, the best option here is to update your files so that they are appropriately tagged with the correct artist. I have a lot of music from DJ labels such as DMC and Mastermix. I have tagged the album artist field of all my DMC music as DMC (to separate from “non DJ” compilation albums which are tagged in the album artist field as “Various Artists”). Once your data is correct and in Roon, you can use Tags in Roon to accomplish this same task. You can then use Focus to select or filter out these tagged items. 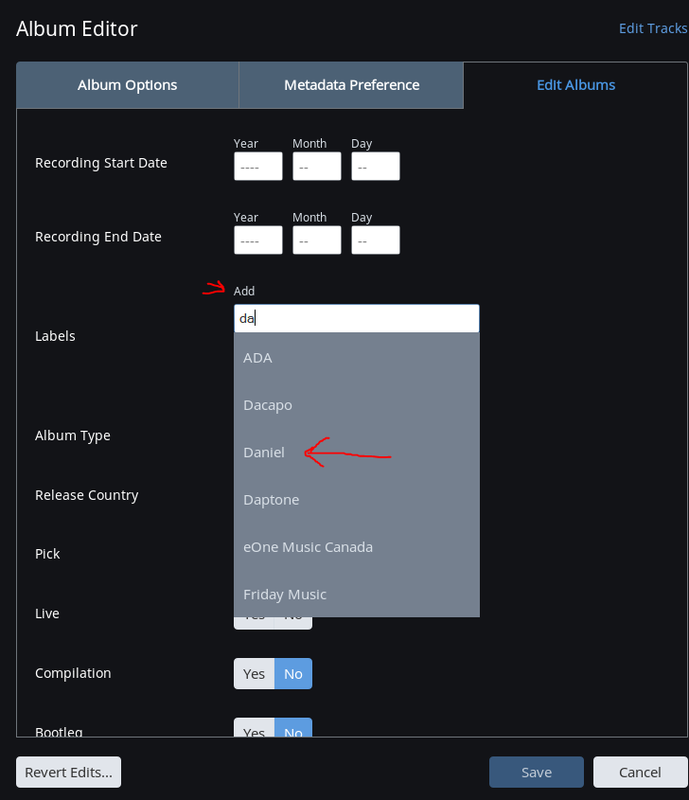 As Roon’s rich metadata is retrieved from external metadata providers, it’s advisable to use the correct metadata that get also presented by them to ensure that the album can be correctly identified. If these ‘DJ Music’ is not that exceptional as that it’s not recognized by online metadata providers, you can use allmusic.com (preffered source or e.g. musicbrainz.org) to search for these. As dylan and blackjack stated, you should be putting the correct information in the fields. So how to differentiate? While they suggest creating a Tag, in this case, since the albums are on actual labels I would add the Label information to the appropriate CDs. 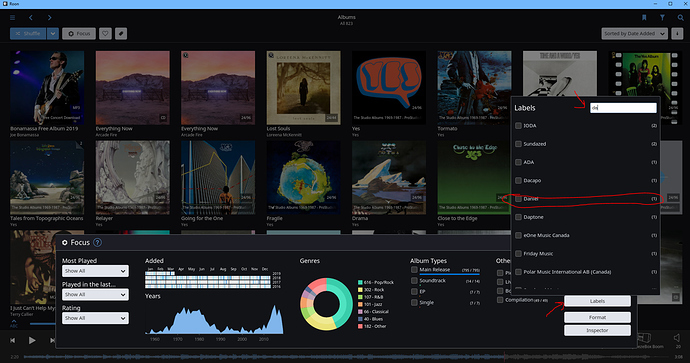 Then in album view, highlight all the DMC albums, choose edit, next to Labels in the ADD section start typing your new label and it will show up on the list. Select it and then hit save on the bottom. Now you have added the label DMC to all the albums. 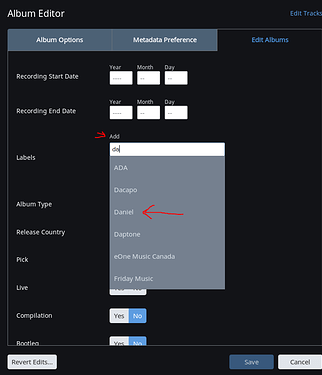 To focus on them, go to the album page, choose Focus, on the far right, and then choose the Labels button, type in your label and it will pop up, choose it, and it will have created a focus on only DMC labeled albums. You can now save the focus as a bookmark for later immediate access. If these are publishers/labels then, if the albums can be identified by Roon, they most likely will have the correct music label (a.k.a. Publisher) already set. Else you can use the correct file tag to store that information in the files. Thanks for all the replies and helpful suggestions again guys. The correct ALBUMARTIST for the DJ stuff would be “Various Artists” as they all tend to be remixes and/or medleys by different artists/groups on each CD. I wanted to easily differentiate these DJ compilations from the standard non-DJ compilations (eg. my “Now That’s What I Call Music…” compilations etc.) hence the use of the label DMC in the albumartist field. My tagging software of choice (TagScanner) supports a “Publisher” tag…can Roon interpret this as “Label” and if not can you recommend any tagging software which Roon can map its “Label” tag to? I don’t know where information you put into the Publisher field in your software will end up in your file. You have to try this yourself. According to File Tag Best Practice Roon makes use of the LABEL tag. Thanks BlackJack…I’ll try adding the label tag to a few albums to check it out.